I've tried excluding and including the thermostat several times. Almost the whole interview completes except for "ThermostatOperatingState" The statemask can never seem to update. It seems like State 0 is off, state 1 is heat, and state 2 is cooling. Is user error involved? Is this a Z-wave.me issue, or is this an issue with the thermostat? I'm trying to control a fan connected to a z-wave power switch, based on the thermostats operating state. When the thermostat is calling for heat, i'd like the fan to come on after a set delay. When the thermostat stops calling for heat, I'd like the fan to shut off after a set delay as well. So I've been poking around a bit. No luck with completing the interview, but the the following HTTP request will return a value that will tell me if the thermostat is calling for heating (1), cooling (2), or is off (0). So now I need to figure out how to monitor that value, and control a switch with it. I feel like I'm fumbling along in the correct direction, at least. I was able to get myself a workaround for this problem. 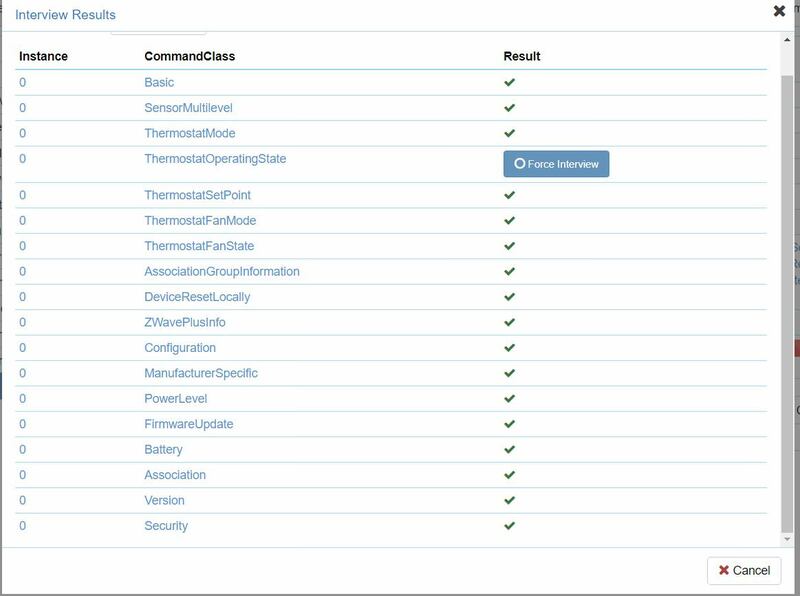 Since the ZTS-500US doesn't create a UI element to tell you the operational status of the heater, I used the HTTP Device app to create one. URL to use is as follows, replace X with correct variable for your setup. Content type is application/JSON, http method is GET. The value produced by the output of http device is logged by influxdb and sent to Grafana, which converts the output into an info panel telling you if the status is ON or OFF.